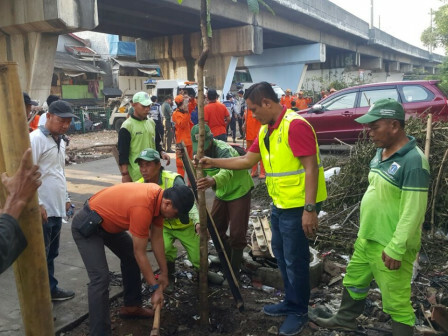 Central Jakarta Administration holds Gerebek Sampah at Mangga Dua Selatan (Madusela) RPTRA, Sawah Besar. Some trees are also planted to decorate this RPTRA.
" There are 50 mahogany and ketapang trees and hundreds of decorative plants that will be planted today"
"To continue last Jumling activity, we will plant some crops and clean RPTRA neighborhoods from trash today," mentioned Sujanto Budiroso, Central Jakarta Government Assistant, in the middle of communal work, Sunday (4/29). According to him, today's Gerebek Sampah is done by 200 joint personnel from Sawah Besar Sub-district PPSU, Environment Sub-dept., Forestry Sub-dept., Bina Marga Sub-dept., Satpol PP, Transportation Sub-dept. Gulkarmat Sub-dept., Police and local residents who live near RPTRA. Besides cleaning the area, they also focus to make this area green. "Later on, we will arrange area near railway that passes through Sawah Besar Sub-district. We will coordinate it with PT. KAI," he informed. Central Jakarta Forestry Sub-dept. Head, Sabdo Kurnianto added, his side prepares shade trees and decorative plants to be planted both on the left and right sides of RPTRA. "There are 50 mahogany and ketapang trees and hundreds of decorative plants that will be planted today," he explained. He also deployed three garbage trucks from Environment Sub-dept. and one operational car from Sub-district PPSU to transport the waste.